These resources should help you along the road of slide guitar mastery!! In my previous article on mastering the slide guitar I took a look at some basic tips and techniques to help you get started. If you haven’t read it yet you can find it here – Slide Guitar 5 – Tips for Success. In this current article I have put together some online resources which will hopefully help you towards mastering the slide guitar. Without any further delay let’s get started on the road to rocking it on the slide guitar. If you are completely new to slide guitar then for me the best place to start is with a great free lesson from Justin Guitar. Justin Guitar is a website run by UK based guitarist Justin Sandercoe. It is a fantastic free website packed full of lessons and resources for learning to play the guitar. If you have never visited his site I can highly recommend it as it is a truly amazing free on-line resource. 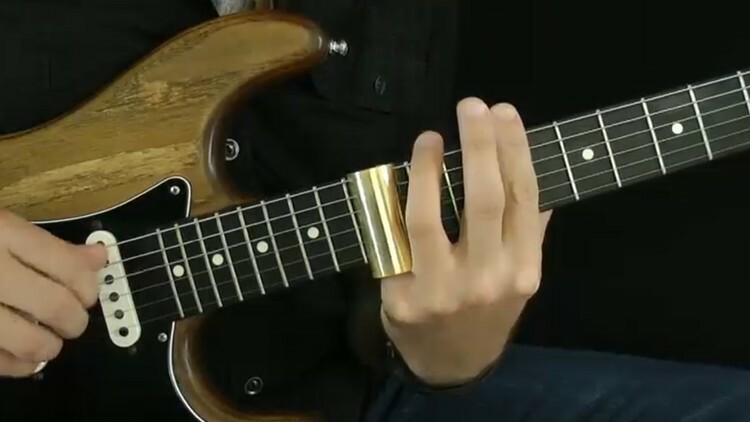 From selection of a slide through to how to use the slide, damping and open tuning this is a really good initial lesson that should get you started. Next up is a great introductory lesson that I found on the Taylor Guitars website. The lesson has been written by Shawn Persinger an accomplished slide guitarist who currently plays with a “Laurel Canyon Sound” tribute band. The beauty of this lesson is that it is all in standard tuning. So if you are worried about open tunings then this lesson gives you plenty of techniques to practice without having to re-tune your guitar. The lesson is very comprehensive and includes both tablature and video of the techniques being demonstrated. Again for the novice it is a fantastic introduction to the techniques you will need for slide guitar. If you have heard of Reverb.com you will know that, as well as being an online platform for buying and selling music equipment, they also produce instructional videos. Fortunately for us they have produced a series of 3 videos on mastering the slide guitar. The videos are presented by Jeff Massey of the Steepwater Band and are an excellent entry level introduction to slide guitar. The first video in the series goes over the usual subjects of guitar setup and slide selection. However, don’t skip through the video as Jeff describes in some detail the different sounds you can achieve with slides made from different materials. In the second video Jeff takes a look at the right and left hand techniques that you will need to practice as you go down the road of mastering the slide guitar. Finally in the third video Jeff takes a look at standard and open tunings. It is well worth a watch as he considers the relative merits of standard and open tuning with respect to the sound you want to achieve with your slide guitar. Now, there are many more free videos on line that will teach you the basics. However, to give you a real boost in mastering the slide guitar then paying for lessons is going to be the quickest way of getting results. Now we have scoured the internet for the best slide guitar course and believe that the best course out there is a new video series on slide guitar from the brilliant guys at JamPlay. Ariel Posen – Speaking with the Slide. Ariel Posen is a singer, songwriter, producer, and internationally-renowned guitarist. He began playing guitar at 9 years old, kicking off a career that eventually found him traveling the globe for his own gigs, including shows as a member of the Juno Award winning, roots-rock band The Bros. Landreth. Several years later, Posen began working on an album of his own, tracking his new songs in the same studio in which his parents once recorded their albums. Once you have got the basics under your belt the course moves onto more advanced techniques allowing you to truly express yourself with the slide. For example Posen considers all the various open tunings as well as how to create a unique sound with your slide. In total there are 30 individual lessons covering all aspects of slide guitar. There are over 5 hours of video lessons all shot in HD from multiple angles so that you can see exactly what is going on. You also get full tablature to cover the lessons and jam tracks so that you can practise your new found skills. Overall this is a very comprehensive course covering all aspects of the slide guitar. You may be wondering how much it will cost to sign up for the course. Well for the full course which includes the 30 individual lessons, over 5 hours of video tuition, tablature and jam tracks you will have to pay just $29.95 which is amazing value. If you are looking to master the slide guitar then this really is the course for you. To find out more details and sign up for the course click on the following link – Ariel Posen – Speaking with slide guitar.